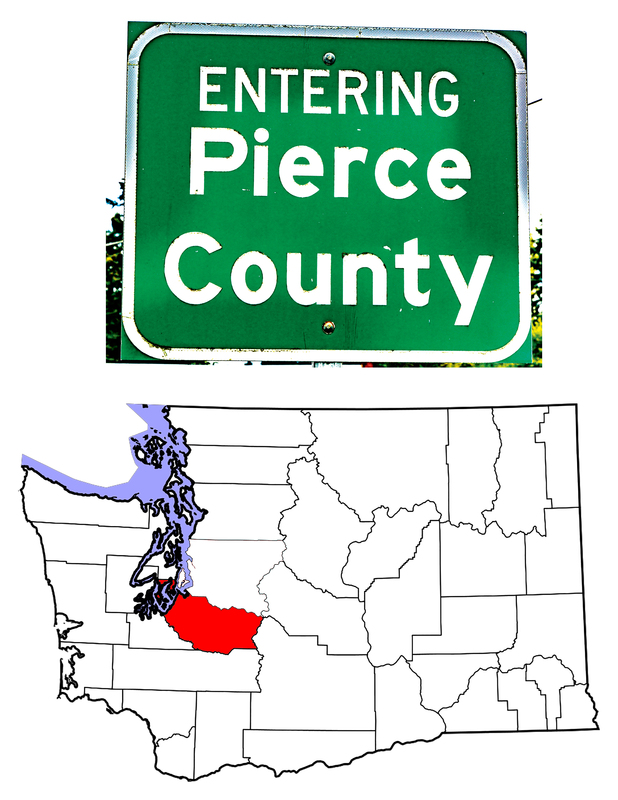 With an estimated 2017 population of 876,764, Pierce County is the second largest county by population in Washington State. City-data.com states that the County is 93% urban and only 7% rural. I would venture that most of the rural area in Pierce County is on the western and southern slopes of Mount Rainier, the tallest mountain in Washington State, and a National Park, the fifth created in the United States back in 1899. The park covers 369 square miles, or most of eastern Pierce County. In 1833, the Hudson’s Bay Company established Fort Nisqually to trade with the indigenous people of the area, the Nisqually, the Puyallup, the Squaxin, the Steilacoom, and the Muckleshoot tribes. These people had been living in the area for thousands of years. After the signing of the Oregon Treaty, and after the establishment of Pierce County, in 1859 Fort Nisqually was turned over to the Americans. Ten years earlier, the U.S. Army established Fort Steilacoom on the shores of Puget Sound southwest of present day Tacoma. By 1854, a town had grown up around the Fort, and Steilacoom became the first town incorporated in Washington Territory. As Steilacoom had a jail, the Territory named it Seat for newly created Pierce County, a role the town held until 1880 when Pierce County residents voted to move the Seat to Tacoma (then known as New Tacoma). 1841 brought the U.S. Navy to Puget Sound in the form of the ships Vincennes and Porpoise under the command of Lt. Charles Wilkes. One of the places Wilkes and his ships visited was a portion of the Sound that Wilkes named Commencement Bay. The town that grew up around the Bay had a settler named Morton McCarver who arrived in 1868. McCarver was quite the promoter, and due largely to his efforts, his new town grew and prospered. McCarver is given credit for bringing the Northern Pacific Railroad to Commencement Bay, where it established its western terminus, and in time the Great Northern, the Union Pacific, and the Milwaukee Road all joined it. 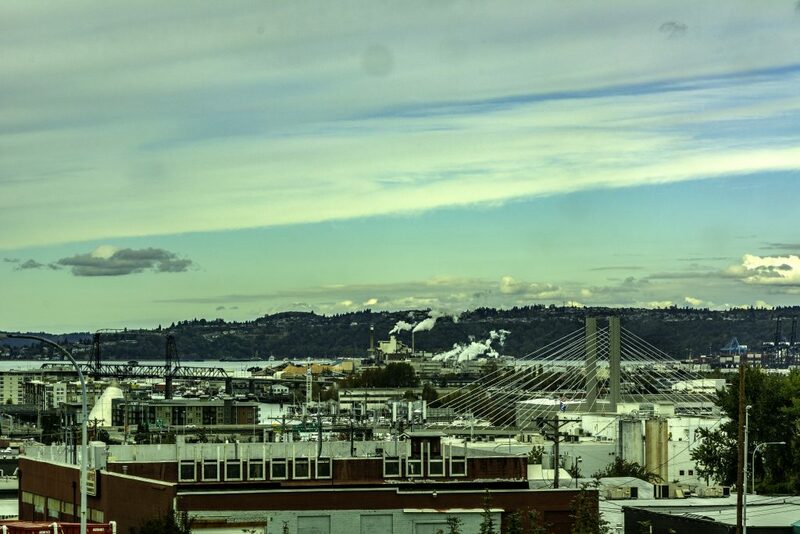 Tacoma became known as “The City of Destiny,” and urban construction followed. In 1893, the trapezoidal City Hall was built in the Italian Renaissance style. 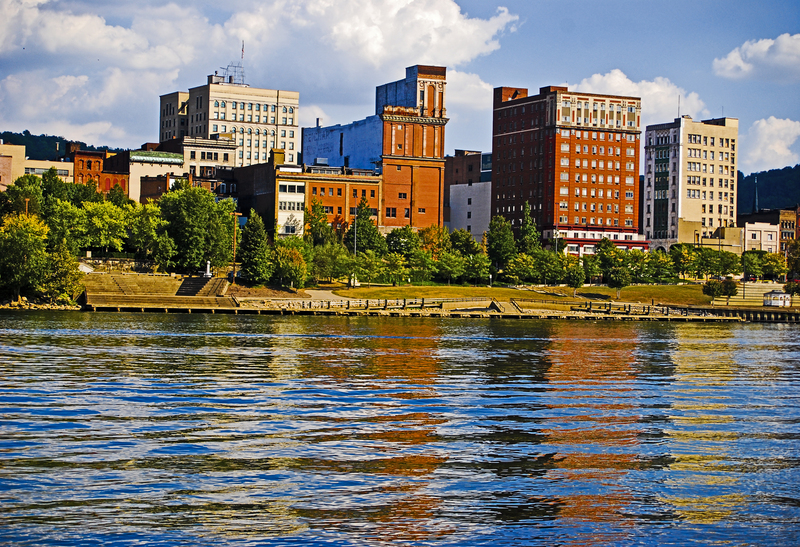 The five-story building with its free-standing five-story campanile, still dominates the skyline in downtown Tacoma, although the building has been poorly used for the past fifty-years. In 1959, the city and county moved their offices into a new structure a few blocks uphill from the old City Hall. 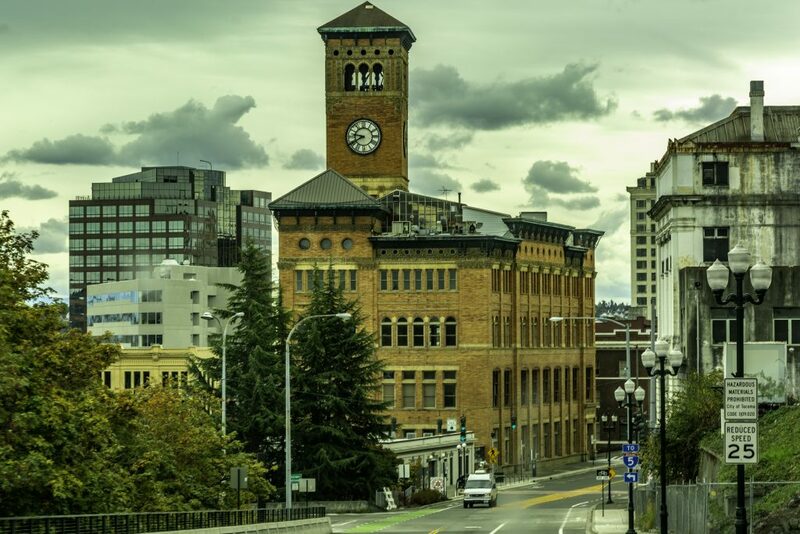 As of the Fall 2018, city officials have contracted with a Seattle firm pledged to renovate the old beauty and make her shine once again. Among the anticipated uses, look for retail and office space on the lower floors and a roof-top restaurant under the clock tower. The Northern Pacific chose Tacoma for its western terminus in 1873. 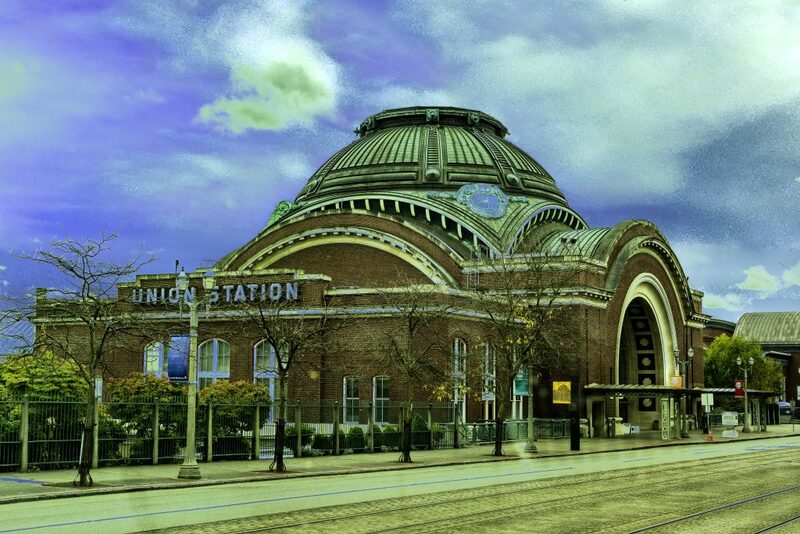 A rail station was built in 1883, and in 1892 the station was moved to downtown Tacoma and enlarged. As is often the case with industrial structures, the station was deemed inadquate for the burgeoning city it served, and in 1906 the architectural firm of Reed and Stem was chosen to design a structure appropriate for “the City of Destiny.” Union Station was completed in 1911 and Reed and Stem went on to design (as part of a team) Grand Central Terminal in New York City. The central dome of Union Station rises ninety feet, and today houses a glass chandelier by reknowned Washington artist Dale Chihuly. Union Station saw its last train depart in 1984, and Amtrak bypasses downtown entirely. The Amtrak station is near a newer Tacoma landmark, the Tacoma Dome. In 1974, Union Station was added to the National Register of Historic Places, and in 1987 the U.S. Congress authorized the General Services Administration to lease the station to house the US District Court for Western Washington. The building is open to the public, and the rotunda can be rented for special events. Pierce County’s industial history does not differ much from that of the rest of the western U.S. An abundance of forest land led to logging operations that not only served to build San Francisco, but the Puget Sound shipping industry. Agriculture played an important role, as did mining. Hops were one of the principal crops, and coal mining flourished in the foothills of Mount Rainier from the 1870s to the 1930s. Of all of these, the port of Tacoma in Commencement Bay remains an important player in the area’s economy. According to Paula Becker, writing in the HistoryLink blog about Pierce County, by 2006, the Port of Tacoma was responsible for 43,000 jobs. But other industries have flourished over the years. 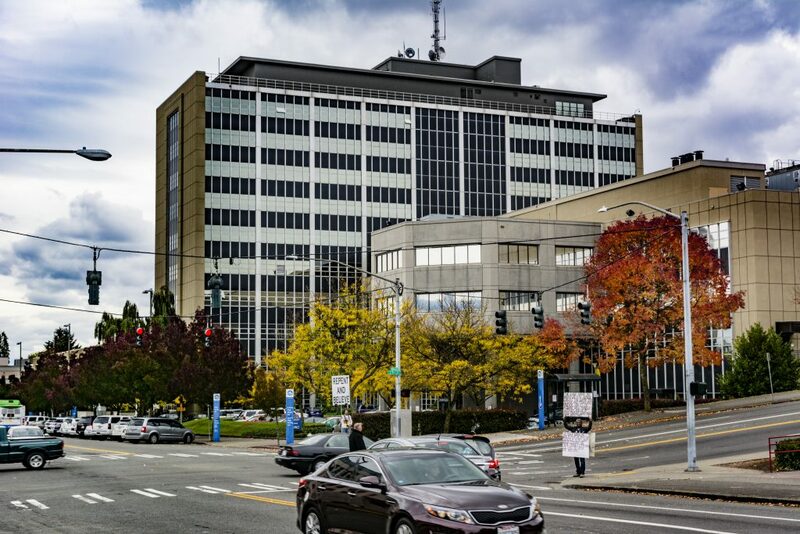 A product Becker calls “perhaps Pierce County’s most far-flung ambassador,” has been manufactured in a unprepossessing building almost hidden below Interstate 705, the spur that connects downtown with Interstate 5. Harry Brown and J.C. Haley founded a candy company in 1914, and in 1923 they invented a candy so tasty that it has become known world-wide. 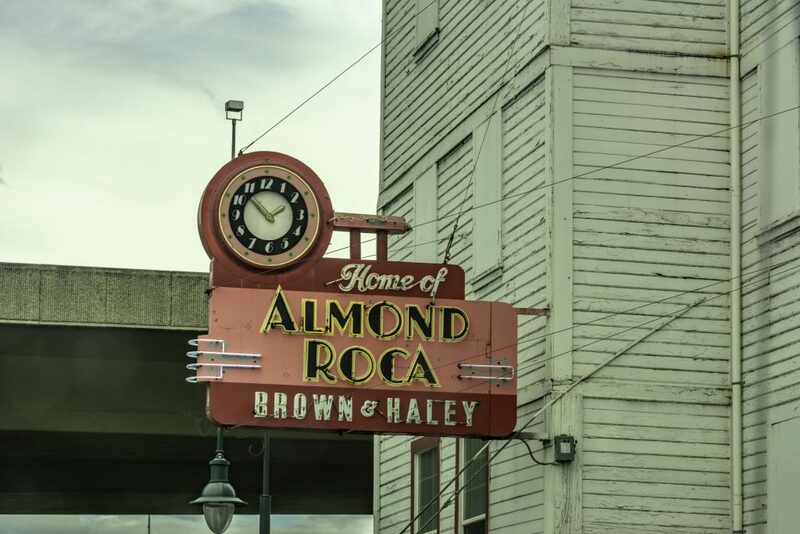 In fact, since 1923, Brown and Haley has been making it daily–Almond Roca that is. And today they also make Macadamia Roca, which I have yet to try. Brown and Haley also make three flavors of the Mountain Bar, which originally had the name Mount Tacoma Bar until it began to sell outside of Pierce County, in other words in that region where Mount Tacoma is commonly referred to as Mount Rainier. On a side note, Frank C. Mars got his start in Tacoma as well, but found the competition too difficult, so he moved east. Who, pray tell, is Frank Mars? Only the founder of the second largest chocolate company in the U.S. The one that makes the Mars Bar, Snickers, 3 Musketeers, M&Ms. That Frank Mars? Yeah, he began in Tacoma too. Becker tells us that “on January 6th, 1917, Pierce County residents voted to deed 70,000 acres of the Nisqually Plains/American Lake area to the United States government for use as a military base.” (HistoryLink.org, File 8001) The area had been used previously as a military training base, and during World War I, Camp Lewis as it was then known trained 60,000 soldiers while the camp’s hospital nursed many of the War’s wounded. World War II saw the base increase in importance, and during both the Korean and Vietnam Wars, the U.S. Army used Fort Lewis extensively. In 1929, Tacoma Field/Pierce County Airport opened, and in 1938, Washington State transferred that property to the federal government as an Army Air Corps base under the name McChord Field. The largest B-25 bomber training base in the country during World War II, in 1948 the base became officially known as McChord Air Force Base. In 2010, McChord and Lewis became Joint Base Lewis-McChord in a federal attempt to make the military more efficient. Joint Base Lewis-McChord covers a wide swath of land in southern Pierce County. 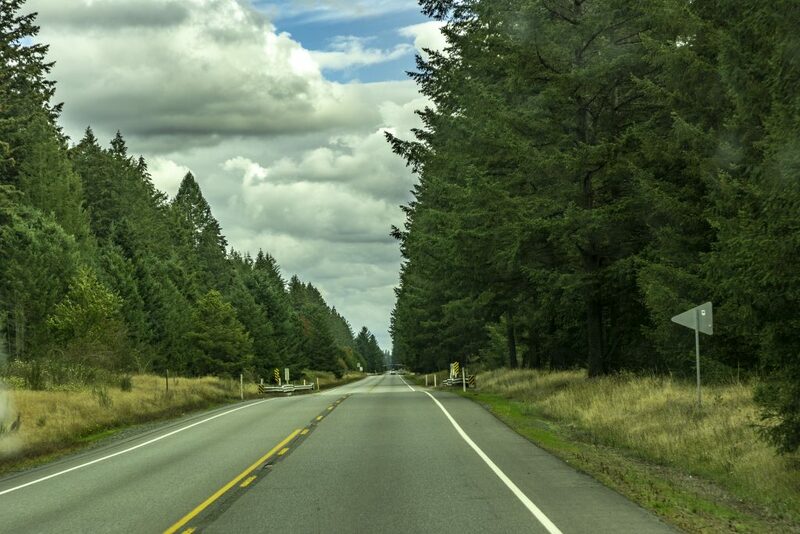 Driving along US Interstate 5, you pass base housing, and further east Washington Highway 507 takes you through the heavily forested land which must be reminiscent of what Pierce County looked like a hundred years ago. One mountain dominates the scenery in the Puget Sound area, the tallest volcano in the lower 48 states, the mountain Captain George Vancouver named for his buddy Rear Admiral Peter Rainier. The indigenous folk had already given the mountain a name, Tacoma, hence the dispute still being waged between Seattle and Tacoma for the proper name of the imposing feature on the eastern skyline. 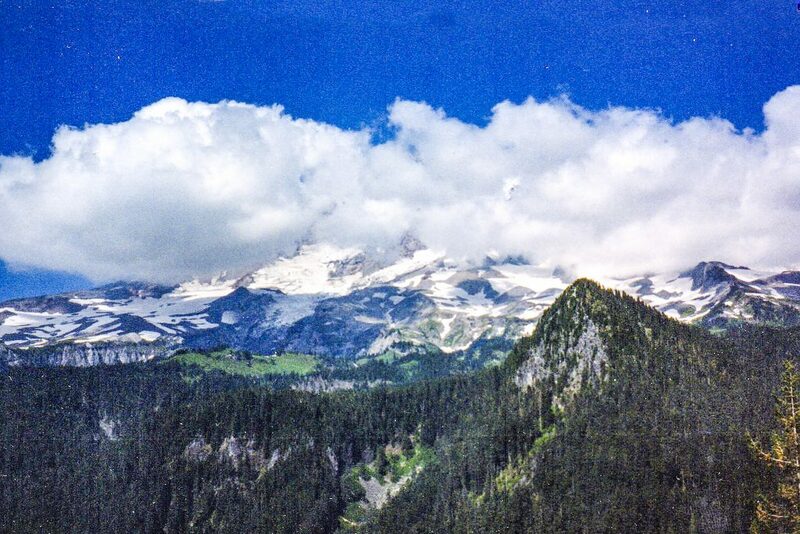 In 1899, Mount Rainier became the U.S.’s fifth National Park, and the whole of the Park is within Pierce County. The volcano has not erupted for more than 150 years, but it is not considered “extinct,” merely “dormant,” and the concern is ever present that should Rainier/Tacoma follow its sister Mount St. Helens, the devastation to the urban landscape downslope would be significant.